Who loves to shop at Target? What a little extra to spend on your next shopping trip? 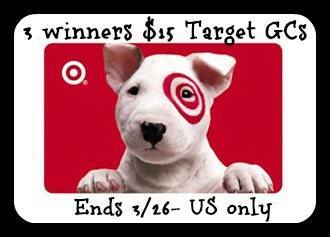 Here you go it’s a $15 Target Gift Card Giveaway so enter on the super easy rafflecopter and GOOD LUCK! Fall is my favourite followed by winter. Love the colours and the changing weather and just knowing that winter is around the corner. My favorite season is spring. I like the warm temperatures, planting season begins and everything comes to life. My favorite season is Spring. I’m hoping we see Spring soon, I’m really tired of winter this year. I like fall best. We don’t really get winter or spring here. Cooler and some rain for fall that lasts until the scorching heat hits again when everyone else gets spring. I love Summer. Then Spring. Spring because the weather and I can start all my gardening. Spring!! Thanks for the giveaway! Something great about each season, but if I had to pick one it would be summer! I LOVE Fall and Spring the best. I love all of the beautiful colors. winter i like it when its cold. My favorite season has always been Summer. Fall – I love wearing comfy hoodies and watching the leaves change, Plus it is the return of FOOTBALL! My favorite season is winter. I love the Fall colors. Summer is my favorite — I love the warm weather and being able to wear shorts and sandals. My favorite season is Fall. Summer definately! all the fun in the sun! Fall is my favorite season. I think i like the fall the best but my allergies don’t agree! Fall is my favorite time of year. The weather is a bit cooler and the kids are in school. Fall is definitely my favorite. The air is crisp, the smells are good, the colors are bright. Ah, love it! Fall is my favorite because of football and the beautiful leaves however i do NOT want to skip over spring and summer to get there! I live in New York’s Hudson Valley so fall is just glorious here with the cooler weather and the gorgeous colors. There are loads of apple orchards here and the smell of the apples as you drive by the orchards is beautiful. It’s just a wonderful season all around. My favorite season is fall as it is not too hot and I love the colors of the changing leaves. My favorite season is summer. I am a teacher so I have to go with summer! My favorite season is fall! Not sure if I like spring or summer better. I like spring because it’s nice to have the warmer weather after the cold, snowy winter, but I love the laziness of a summer day. I honestly like them all and I’m always ready for the next season to arrive. I guess if I had to choose a favorite, I would pick winter. It is a tie between summer and fall! Summer because I love the hot days and warm nights and the kids home from school. Fall because I like how it looks and smell outside, Halloween, Thanksgiving, and the kids back to school! Summer all the way. I love to feel the sun… Might have something to do with living with Maine and having such a loooong winter. I like fall the best, all the leaves changing is so pretty. Autumn is usually my favorite season–but there are great things about each season! Fal is my favorite season, I love the cooler weather, smell of the damp leaves, just a great time to be out and walking with the dogs! My favorite season is the Fall! Summer is my most favorite season!!! My favorite season is Fall. I love the cooler weather and the “crisp” feel of the air. It’s hard to pick, all seasons have their pros and cons. I guess summer is my favorite because I can go swimming which I love, but I hate it being overly hot for my day to day stuff. I think spring is my favorite for going to work and the things I need to do day to day. Fall or winter would be my favorite! Anything but summer. Autumn is my favorite, the smells and the colors, beautiful. I can’t choose between Spring in Fall, they both are beautiful season of change. I love spring. I can’t wait for birds in my bird baths & hummingbirds at my feeder. Winter is my favorite season. But here in the Southern California Desert, we only have 2 seasons: fall and summer. It never really gets cold enough to call it winter, and when the warm weather hits, there’s no gradual warm up – just straight heat. I like Fall the best. My favorite season is spring. My favorite is season is Spring. I think it’s because it’s getting warmer and all the flowers bloom. When I was younger I would of said summer, as I get older I say spring, summer gets too hot for me know. At least where I live now. Summer is definitely my favorite season. The hotter the better! I hate cold weather and at some time during all the other seasons, you will have cold weather.